Chrome front bumper for 07+ that does NOT have sonar sensors...just the regular bumper. Includes mounting hardware, plastic bumper insert, and plastic fog cap inserts. Willing to take reasonable prices into consideration. 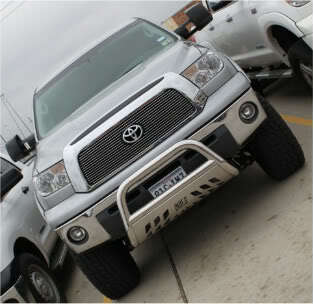 im in the market for a front bumper and rear one too!!!! how much are you selling it for? shoot.... I'll take a FREE bumper!!! How in the world are you in need of both a front and rear? LOL check your PMs. LOL, i know huh, well long story short, front bumper due to a little road rage after my first deployment to Iraq....Rear bumper due to my g/f backing up and hitting a tree. Bumper is sold to a Cali resident that had a run in with a semi. It's easier to sell it there than transport it back to Houston. Cali dude backing out because he wants sonar since he can't drive. If it's not sold by mid-December, I may transport it to Houston. let me know if it does make it to Houston. Will do knowing your situation. It just depends on what else I'm hauling home besides the dogs cuz I'm moving to a new house out there and might bring home some furniture.